In celebration of Presidents’ Day, on Monday, February 18th, 2019, the DHSM is opening an exhibit celebrating American Presidents. The exhibit runs through March. Norfolk County, known as the “County of Presidents,” is the birthplace of four U.S. Presidents: John Adams, John Quincy Adams, John F. Kennedy, and George Herbert Walker Bush. 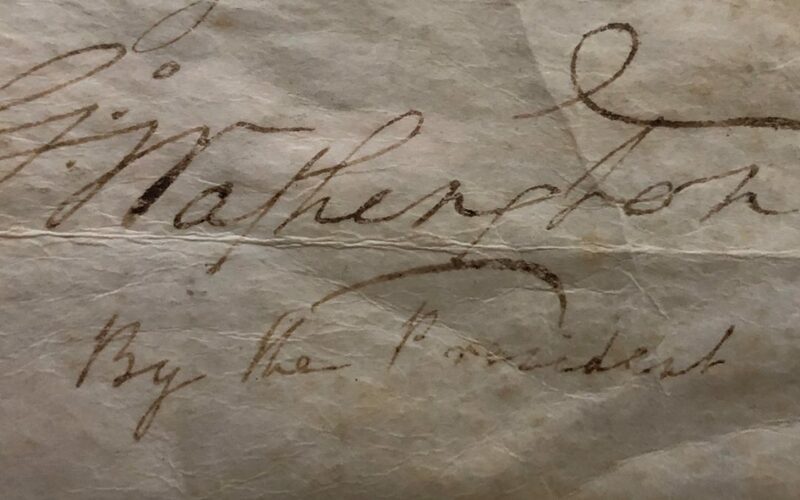 Signatures or birth certificates of these presidents will be on display, as well as signatures by the country’s first president, George Washington, among others. The exhibit will feature documents signed by American presidents with ties to Dedham and Norfolk County, from the founding of the country through the 20th century. Visitors will also have access to hands-on materials copied from the Registry of Deeds, a collaborator in the exhibition. The museum will be open specially on Monday, February 18th from 9:00-1:00. Otherwise, visitors may see the exhibit during regular museum hours, Tuesday-Friday, 9:00-5:00 and the 2nd and 4th Saturday of each month from 11:00-2:00. For more information, call 781.326.1385. Caption: Signature of George Washington on a document nominating Albion Cox to the U.S. Mint, April 4, 1794. Collection of Dedham Historical Society & Museum.